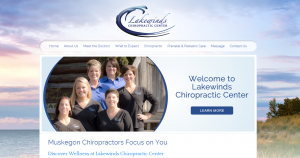 Opened in 2007, Lakewinds Chiropractic Center serves the Muskegon, MI community with chiropractic care for all ages – from infants to seniors and everywhere in between. Drs. Sandra Moore and Susan Isaacs strive to connect with their patients on a personal level, offering massage therapy and chiropractic services to support a lifetime of great health. They also specialize in prenatal and pediatric adjustments to support body balance during pregnancy and healthy adolescent growth.